X-Men's Apocalypse Enraging Hindu Believers? It's a sign of the times when a part of me is more excited about a fictional interdimensional film franchise than I am about the new Star Wars film. No matter how well-crafted The Force Awakens proves to be, I kind of already know what I'm getting out of the box. In that sense, nothing new is really being gained from the experience, and what we're left with is some very, very expensive fanfic from a guy who either did or didn't royally s**t the Star Trek bed, depending on your perspective. It also doesn't help that I'm not a huge fan of packed movie theaters. While I genuinely prefer to see films in theaters, at the same time I think there needs to be a discount on ticket prices for having to smell total stranger's farts for two hours. It's bad enough that we have to put up with recycled farts on airplanes, but then again it's not like any of us consider air travel a form of entertainment. People consume books, magazines, and anything they can stuff on their iPad in an attempt to mentally escape that particularly harsh reality. Movie theaters tend to be very similar during blockbuster opening weekends, only you do have the option to exit in an orderly fashion whenever you see fit. You're also more than likely assuming that the price of admission includes some form of entertainment, though those nasty pickles at the concession stand that have been floating in a giant jar of green goo water for the past five years will cost you extra. Based on the trailers and preview footage released so far, I would argue that Ball Fondlers is an even bigger thrill ride full of guns, explosions, and poufy hair buns than the new Star Wars film. It also happens to be a fictional creation within a television show that requires Rick, Morty and Summer to travel to another dimension to see in a theater, but now we're just getting down to semantics. The only difference with Star Wars is that it has billions of marketing dollars behind the IP at this point once you factor in the licensed merchandising that's spamming every retail outlet within the continental United States and beyond. Give Rick and Morty another few seasons, and I could easily see Ball Fondlers merchandise flooding the marketplace by 2020. Think of all the merchandising potential. You'd have some obvious stuff like Axe Detailer cross-promotions, to more random things like Ball Fondlers-flavored baby food. I mean, if you can serve your kids Yoda heads for dinner, why not your favorite Ball Fondlers characters? 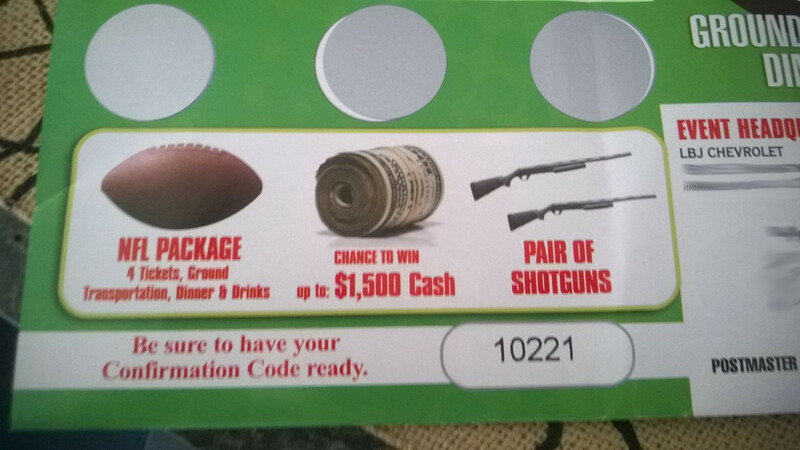 You know you live in the South when you receive flyers from car dealerships that come bundled with a scratch off contest where one of the main prizes is a pair of shotguns. No joke. As much as I do tend to poke fun of certain regional stereotypes, the whole gun worship aspect of living in parts of North America does tend to go a bit overboard. Seriously – two shotguns for a bonus prize for buying a crappy used car? Really? First off, it speaks volumes about the company and particular car dealerships involved that they would even consider a “pair of shotguns” a valid incentive for new car ownership. Does the car come with a free gun rack to display my fresh pair of shotguns? Are they a matched pair so that I can use them to woo potential mates out on a hunting date? Will a pair of shotguns make me drive my new used car better? Tune in next time for the shocking answers to these burning questions, and even more deep mysteries of the infinite cosmos!